Yves here. Note that this post considers the cost of hard v. soft Brexit, as in having the UK lose access to the single market versus remain within it. It does not consider the cost of what we have been calling a “disorderly Brexit” or what others have labeled “crashing out of the EU,” meaning a Brexit with no deal at all. Note that this paper only gives some consideration to non-tarrif barriers, like divergence of technical standards. It does not appear to factor in things like massive lines at customs and documentation requirements in a hard Brexit scenaio. So if anything, the estimates are likely to be conservative. Production processes are becoming increasingly global. Acemoglu (2012) and Johnson (2014) have argued that, as a result, we can no longer consider bilateral trade in isolation when we evaluate trade policy. In a recent paper (Vandenbussche et al. 2017), we develop a new approach to evaluate trade policy when global value networks exist. It extends a traditional gravity model to include sector-level input-output linkages in production. This allows a more complete assessment of trade policy shocks. While the framework is entirely general, we used it to evaluate the impact of Brexit on the UK and the EU27. Our world input-output model can be used to predict the trade impact of the UK’s withdrawal from the EU on the domestic value added, and employment for every individual EU country involved. The trade impact is arguably the most important effect and leaves aside less influential, channels such as foreign direct investment (FDI) effects, budgetary issues, or potential trade diversion effects. Losses from the trade impact of Brexit vary by EU country, depending on its openness to trade, its trade intensity with the UK and vice versa, its sectoral composition, and the positioning of its sectors within the global supply chain. The conventional wisdom of Brexit is that the UK has a great deal to lose, but a sector-level input-output approach indicates that there are only losers from Brexit. Both the UK and each bilateral trading partner in the EU would suffer substantial losses if they were denied free-trade access to each other’s market. Our analysis clearly shows that the EU27 stands to lose considerably more than previously thought. This is because EU27 production networks are closely integrated, which implies that tariff changes with the UK do not affect only direct trade bilateral flows, but also indirect trade flows via other EU countries. For example, the Belgian steel sector would suffer both through a direct reduction in exports to the UK, and also through a reduction in demand for steel that would have been used in German-built cars for the UK. On average these indirect effects account for about 25% of the total effect of Brexit, although their magnitude varies across EU countries. For example, in Slovenia indirect trade effects account for 50% of the total impact of Brexit, while in Malta they represent only 5%. To create these impact estimates, we take the predictions from our world input-output model to the World-Input-Output-Database (WIOD). 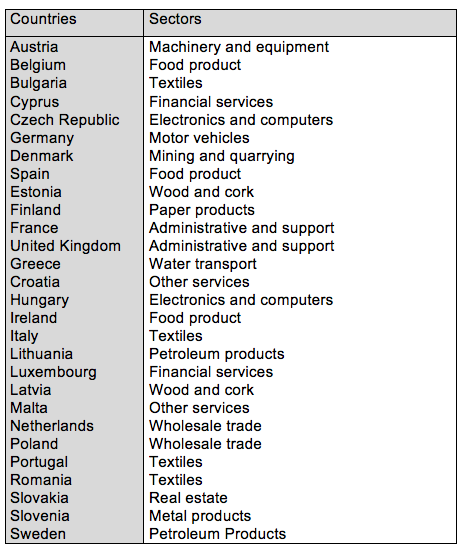 This database makes it possible to identify production networks and current supply chains in the EU For every country-sector in the EU28, WIOD provides total production, the inputs needed from other country-sectors, and how output is subsequently used by other country-sectors in their production process. Using this, we can distinguish ‘direct’ exports to the UK from ‘indirect’ exports that were shipped to third countries, then to the UK. Including indirect exports provides a more complete assessment of Brexit by identifying the European production network and value chains in detail. To empirically obtain the employment effects of Brexit, we consider trade in domestic value added rather than gross trade. The reason is that only domestic value added embedded in exports, matters for domestic employment. Soft Brexit: Import tariffs between the UK and the EU27 remain zero. Non-tariff barriers (NTBs), measuring divergence in technical standards and other factors, would increase to the equivalent of a 2.77% tariff. Hard Brexit: Import tariffs between the UK and the rest of the EU would rise to most-favoured nation (MFN) rates. NTBs would rise to 8.32%. Source: Dhingra et al. (2017). Figure 1 shows projected job losses for each Brexit scenario when both the UK and the EU27 raise their barriers. The bars indicate the normalised job losses as a percentage of a country’s active population. 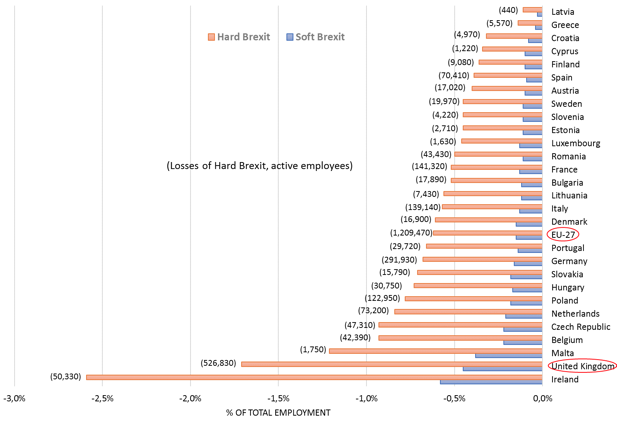 Figure 1 also reports, in brackets, the worst-case number of job losses in each EU country if there was a hard Brexit. Our results clearly indicate that the UK would be hit relatively harder than the rest of the EU27 (except for Ireland) in both scenarios. In either scenario, Brexit would lead to a relative reduction in economic activity in the UK and EU27. Hard Brexit would cost 526,830 jobs in the UK, four times as many as a soft Brexit. Hard Brexit would cost 1,209,470 jobs in the EU27, again, four times as many as for a soft Brexit. Hard Brexit suggests a loss of 4.47% of UK GDP, again four times as much as a soft Brexit (1.21%). The loss of UK value added would be about three times as large as for the EU27, which would lose 1.54% of EU GDP (0.38% for a soft Brexit). Again, these impacts differ substantially across EU-27 member states. The EU-27 countries that lose relatively most are those with close historical and geographical ties to the UK (Ireland or Malta, for example) and small open economies (Belgium, the Netherlands, and the Czech Republic). While Germany would suffer the largest absolute number of job losses (291,930), as a percentage of the total active population its relative losses are more moderate when compared to the other EU27 countries. Source: Vandenbussche et al. (2017). Note: Employment data in Eurostat is missing for some sectors in the following countries: Estonia, Latvia, Lithuania, Luxembourg, Malta and Sweden. For each EU country, Table 2 shows which sector will be most affected under a hard Brexit scenario. For Germany, most jobs will be lost in motor vehicle manufacturing. For Belgium job losses are highest in the food sector. For countries such as France, most jobs are lost in administrative and support activities. Again our results differ from other studies because our methodology additionally accounts for input-output linkages between goods and services sectors, and includes both direct and indirect trade with the UK. Our findings indicate that both the UK and the EU27 would suffer substantial losses if they are denied free trade access to each other’s market when Brexit happens. While the current belief is that especially the UK has a great deal to lose from Brexit, our sector-level input-output approach clearly shows that the EU27 stands to lose considerably more than previous estimates. The reason is that EU27 production networks are closely integrated, which implies that tariff changes with the UK do not just affect each EU27 country’s direct bilateral trade flow to the UK but also the indirect trade flows (via third countries) that end up in the UK. We estimate these indirect effects will account, on average, for about 25% of the total Brexit impact, but for some EU countries, these indirect effects would create 50% of the total employment effects. Compared to other studies, the inclusion of this production network structure increases the projected negative impact of Brexit on the EU27. This entry was posted in Brexit, Doomsday scenarios, Economic fundamentals, Free markets and their discontents, Globalization, Guest Post on December 1, 2017 by Yves Smith. Comment on the comment: The question is, does this reduction seriously effect the top tier economic predators enough to hurt? The small fry can all eat cake if bread is not available. One less horsie in the stable of polo ponies can be endured. Grooms are a dime a dozen. Hmmm…. Hard(er) times ahead for someone. I wonder who? Good question. We know that those at the top are best able to absorb such shocks, and often best-placed to take advantage of them. IF, as Russia has reportedly responded to sanctions (true? ), the exit were being used to create greater food sovereignty and self-sufficiency in the UK, a new economic emphasis on basic needs. . . fat chance in the short run. But if Labor regains power a thoughtful re-integration with the rest of Europe and such an emphasis could be quite meaningful. What we see globally meanwhile is a great failure at the political level. . . of belief in the human experiment or our ability to change. The original article is behind a paywall, so I could not get information on the diachronic aspect of those trade issues. I suspect the impact will be near immediate, i.e. within a year of a “hard Brexit”, but probably more protracted in the case of a “soft Brexit”. The fact that “there are only losers”, and that the EU27 stands to suffer substantially more than generally assumed reinforces my conviction that a door will always be kept open, despite article 50 and with no regard to legalistic scruples, so that the UK can decide at the last minute to renounce the Brexit and remain in the EU (and that this is what will eventually happen, though the UK will lose all current privileges it enjoyed so far). Some readers like vlade are closer to the real economy action and could identify any holes in the EU-related analysis. For instance, this post assumes the biggest losses in Germany would be in the auto industry. Yet auto makers are backing Merkel in being tough with the UK. They have to understand their economics. What I have assumed is at least with respect to the aerospace and transport manufacturing businesses that the global manufacturers will shift operations out of the UK save for manufacture destined for UK buyers. One reader pointed out that European automakers are operating at well below capacity, so for any production that is not highly specialized (above my pay grade to know what is and isn’t), it may be possible to shift a lot of manufacturing from the UK to the Continent without making much if any capital investment. Now there is some manufacturing in the UK that is very specialized; the Brits like to go on about the manufacture of wings. But even there, Germany is succeeding in winning contracts for the next-gen planes. TBH, I didn’t even go there, although some of the data looks strange to me (say the sectors hit for some countries dont’ make much sense to me, but I’d have to see details). My main issue on this is what you and PK wrote – relocation to the EU, plus the fact that Colonel (and I to a bit of lesser extent) mention now and then – all the UK companies that export, already export, so there are unlikely to be new markets for the UK products (except at much lower prices, which we know is not going to work due to inputs mostly being not in sterling). EU, on the other hand, has a much more opportunities – and it doesn’t have to even be a non-EU destination. If a car maker relocates to the EU, all of sudden all its sub-contractors which now class as export to the UK, will just have to export to a slightly different EU country. No jobs lost. Another thing this model does not account for is the relocation of industry and business out of the UK to avoid duty, regulatory and disruption effects. While some may leave Europe (Airbus is apparently threatening to relocate wing manufacture to its Chinese facilities), others will simply hop across the Channel or Irish Sea. I do wonder if psychologically, the merits of ‘scoring a win’ by attracting new business will, for EU politicians, see them overlook notional drops in GNP. Some of the noises coming from the Netherlands (Amsterdam seems to be quite a big winner so far) would indicate that this is a significant impact – the Dutch seem to have switched from one of the UK’s potential allies to hardliners. Haha, I was writing a comment on a different aspect of this issue at the same time you were. The model as described in the post seems it can only come out with losses for everybody, so the fact, that there are losses for everybody in this model isn’t really a surprise from the detailed analysis, but the consequence of assuming more trade equals higher GDP and therefore any impediment to trade reduces GDP. Given economics of scale and related productivity increases, one probably expects this in principle to happen. There are however some short term benefits, that partially might cancel out the losses. The countries in the EU, that are hardest hit by Brexit, are mostly countries, that are close to overheating without rising interest rates. On the other hand, the big southern economies of Italy and Spain, that still need low interest rates, are not hit very much. So in the short term, Brexit could help in rebalancing the Eurozone. As well there is the possibility, that western Europe’s relationship with Russia will improve. There is a wide spectrum of opinions in Europe on how the ties with Russia should look like, and the UK certainly is on the more isolationist side. Considering the views expressed in the press and by people on the ground, the UK is probably uniquely negative in western Europe. If trade is so positive, then certainly better relations with Russia are positive for the EU. Of course I believe as visitor above as well, that the EU would allow the cancellation of Brexit until the very last minute, if the UK would move in that direction in a way, that allows the conclusion, that Brexit is really cancelled and not just postponed a few years. The latter might reduce the economic losses in models, but in the real world would bind too much administrative resources. To keep a certain degree of capacity to act, Brexit needs to be handled in a finite time frame. There were only two solutions for the question of Brexit: A referendum, where the majority decides to leave, which has happened or a referendum, where the majority for the EU would be so large, that UKippers give up all hope. Farage put that number at about 60%. In any other case, Brexit would have hung around in EU politics at every turn. I think the issue of the UK’s relationship with the EU is set to run and run whatever happens. Even if Brexit does go ahead, the demographics of the vote suggest that it is quite possible that by 2019 the majority opinion will already be for continued EU membership. Whether that will result in Brexit being cancelled is a moot point as the press barons will do everything in their power to prevent any revote. But the UK was always going to face a tough period between now and 2030 as the boomers retire, reduce their contribution to the government tax take, and increase their demands on government pensions and health and social care spending. That will happen anyway so if Brexit goes ahead and the economy hits an adverse headwind as a result you can expect discontent (already significant) to grow. At some point this will revive the issue of returning to EU membership as people look back to the ‘good old days’ when the UK was in the EU. This is all particularly toxic as the old voted to deprive the young of the future they wanted and the young (according to my daughters) are extremely resentful about this. As a result Brexit has poisoned the well for British society for decades to come. One of the reasons I am considering emigrating is because in my experience the UK has become a deeply unpleasant country in which to live, where many Leavers and Remainers are barely talking to each other and you have to plan social events in order to keep people apart. The divisions have become so deep that I fear this is going to be a problem for years to come. Indeed, no matter the reality of EU, if the UK is in economic doldrums for the next decade (for whatever reason), I suspect there will be a strong “this would not have happened if we were in EU” move (unless EU is even worse off then the UK for most of it). Predictions on politics in the UK seem to be very difficult to me at the moment, but I doubt, that a narrow shift in opinion will result in another referendum before the leave date. The current gouvernment will ensure, that Brexit happens on its watch and given the A50 dynamics, a vote in the commons probably can only be between the agreed deal brexit and disorderly brexit. So even if popular opinion shifts against brexit, I think it is more likely brexit will still happen. My no-brexit-scenario would be, May, Gove or some other important brexit figure declares publicly, that brexit can’t be done in a sane way and has to be cancelled to save the country. Perhaps alternatively, if Corbin comes out really strongly in favour of cancelling brexit and somehow manages with the help of Tory-backbenchers to enforce a general election. As you say, for the UK the debate about the EU might not end, even if brexit happens. But for the EU, the situation is much clearer after brexit and the administrative resources can be used to do other things after some time. There are important things to do, e.g. agrar policy needs urgently to be updated towards a more sustainable way of food-production. Its a huge issue, and largely beyond the immediate topic at hand, but politically and economically, I don’t doubt this changes things quite radically for the EU. For one thing, the UK has, in my opinion, been a pretty malign influence within the EU, on the wrong side of nearly every internal battle from the point of view of progressives and environmentalists. The UK has been a major blocker of agricultural reform, especially in moving away from a ‘quantity’ to a ‘quality’ agriculture. It has been the most enthusiastic supporter of competition and privatisation policies, and had a major role in blocking both the environmental and social side of the EU. As an example, UK ministers openly boasted about having shot down the Soils Directive. While, due to the current dominance of the centre right in Europe things won’t change quickly, I do think the loss of the UK will ensure a better balance in favour of the social side of Europe – some argue this is already happening. It will also, for good or ill (primarily ill I think) strengthen the eurozone, and encourage Macron in what seems to be his centralising tendency. Brussels has always been a fan of disaster capitalism, in that its always seen crises as the perfect opportunities to pursue their agendas. I don’t doubt that a major economic hit caused by a chaotic Brexit will be seen as one such opportunity. It remains to be seen in what direction it will take Europe.